"September is beautiful, but kind of heavy" says Emily. only eight weeks until the snow flies up there. The heaviest thing about September are the peaches. The Red Havens weigh down your hand like a five-pin bowling ball. if you don't catch them first. Winter encroaches with melancholy sweetness. The heaviness lies in the work to be done. It is always tempting to gather too much. Some for the freezer - for months down the road. Preferring to save their juicy ripeness as a surprise again for next year. We eat them standing, leaning over the sink. Toothsome glory running down our chins. I discovered a wonderful recipe which uses fresh peaches and plums, or any other seasonal fruit, and had to share it. Enjoy! Preheat the oven to 375 degrees Celcius. Butter a 9 inch pie pan or a deep baking dish. Scald the plums and peaches in boiling water for about 15 seconds. Pour into a colander, rinse with cold water, and slip off the skins. Cut in half and remove the pits. Place the plums on the bottom of the pie pan. Arrange peach halves over the plums. Combine the maple syrup, 1 Tbsp flour, liqueur, and orange zest in a small bowl. Pour over the fruit. Mix the oatmeal, flour, Sucanat, and salt in a food processor or bowl. Add the butter pieces. Process or cut the butter with 2 knives until crumbly. Stir in the pecans. Sprinkle the topping over the fruit. Bake for 35-40 minutes, or until the crust is golden. Let cool for 10 minutes to allow the top to become crisp. Serve warm, garnished with dollops of whipped cream, if desired. I have heard it said, that if everyone around were to throw their problems in a big pile with the option of trading for someone else's, most people, after thinking about it, would pull their own problems back out again. I would guess the person from whom this quote came meant that, like a pair of worn-in shoes, our own difficulties and challenges are tailor made for us and best worn by ourselves. I feel that way sometimes, especially after I hear about some of the struggles other people are dealing with. When we are wrapped up in our own world which, arguably, with the invention of earbuds and smartphones, happens with increasing regularity, it can be tempting to believe so one else suffers like we do, no one else has struggles like ours. During one of my recent visits home, my dad said he had heard some stories lately from people he knew, about what they had been through in their lives, and he wondered how they could carry on. If it is true that we are each only given what we can handle, then I would argue that many people must be far stronger than I. When I stop and think about it, I have it good. Some days I get a lot of things done, and those are my 'productive' days. On those days, I take care of business, go for a run, cook my family a great meal, get some work done around the house. Other days, I write, go for a walk to clear my head, find a treasure at the thrift shop. Those are good days, too. Other days, I don't know if I'm coming or going. Nothing seems to get accomplished and my ears ache. Those are the days I need to listen to my body and have a nap after lunch, or go to bed early with a good book and try again tomorrow. Some days I spend socially, whether by working with people or by meeting friends for coffee. I have several good friends here and I love to visit with them. Generally, we take turns talking and spend the visit catching up, but sometimes I have to sit and listen because someone just needs my ear. One of my old friends' mother was a teacher. She frequently told me I would make a good teacher, and when I asked her why, she said it was because I was a good listener. That surprised me because, until then, I had not considered myself a good listener, and I always believed the job of a teacher was to stand up in front of a classroom and lecture. As I later learned, that was a small part of effective teaching. A good teacher listens to the responses of her students and knows how to proceed with the lesson. She must make adjustments for each child, and make allowances for her student's situation in life and temperament. I learned so much from teaching my own children to read, for example. I learned intimately how each of their minds processed information and put different elements together from the give and take of our lessons. When I was a child in school I often lamented how long it took me to 'get' a concept, particularly in science and math, and sometimes I had to read story problems over and over to focus enough to understand them. Reading is a type of listening, and little did I know I was learning the art of listening with every challenging concept. I don't think everyone is as attached to listening as an artform. I remember driving with my husband, shortly after we were married, up the Alaska Highway to Whitehorse. It was the 50th anniversary of the world- famous highway and the frost heaved asphalt, which was always under construction in summer, was bumper to bumper with recreational vehicles. At one construction road block, we had to wait for quite a long time. We got out of the car to stretch our legs as did the couple in the R.V. in front of us, which was tattooed with stickers from the 50 States. The couple decided to chat with us and began the conversation with a question, which was followed by another question, which was followed by another. The couple never waited for our answer before they asked the next question, merely said "uh huh?" and looked around impatiently before asking another question they didn't really want an answer to. To be a good listener, you have to like the sound of other people's voices almost as much as the sound of your own. Yesterday afternoon, after spending a good chunk of my day listening to the tearful, very personal struggles of a couple of friends, I had a half hour to myself before my youngest daughter would be home from school. My eldest, home from a trip abroad and searching for his next opportunity in life, was even out with a friend. I made some tea and sat down to enjoy it. I thought how honoured I was to have the trust and friendship of those two women, and even though I had produced little to show for my day - no housework except some sheets washed and piled in a heap on a chair - I felt good. I felt good about myself as a friend - I wasn't always so compassionate - and I felt happy that my own struggles were not weighing me down enough to close my ears to others' troubles. I knew inevitably they would again sometime in the future, and then it would be my turn to talk. I pondered my youngest's recent struggles with adjusting to the back-to-school routine and was glad I was able to listen well to her and respond accordingly. She is settling in nicely now. I sat back with my tea to enjoy my quiet half hour. After about three minutes of blissful silence, the front door opened and my eldest son leapt up the stairs, two at a time. I felt myself inhale sharply. "How was your day, Mom?" 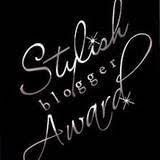 I exhaled slowly and resumed sipping my tea. "Good, how was yours?" We did not pick up our son from the airport. The parents of one of his travelling companions owned a van large enough to fit the whole group and their luggage. I was in the kitchen when the door opened and a familiar, "Hello family!" sounded in the hallway. Ian, eighteen years old and recently graduated from high school, spent five weeks of the summer touring around Western Europe. Now he was home. After giving everyone a brief hug, he immediately emptied the contents of his backpack onto the floor and passed around the gifts he had bought for all of us: beautiful scarves for the girls and I, a Tour de France t-shirt for his dad, a 'Roma City' t-shirt with a map of all the sights for his brother, and ten bars of Swiss chocolate, less one. "I got hungry on the plane," he explained. We had so many questions. The emails and facebook messages had been few and far between, which was good. I had told him to enjoy everything without worrying about us at home. The entire time Ian was away, he told us, he had not been annoyed or bothered by anything. Anytime anything or anyone became difficult he would say to himself 'Whatever. I'm in Rome!" or," Who cares. I'm in Paris!' We spent the evening listening to stories and anecdotes of his adventures and looked forward to viewing the 1500 photos stored on the memory card of the camera his sister had loaned him for the trip. I watched his face, which positively glowed as he talked, and it was obvious to me that his heart was still among the lights, sights and sounds of the last city he visited - Paris. As we chatted I soaked his words up like a sponge, wetting the colours of my own imagination in an attempt to paint pictures in my mind of Holland, Switzerland, Italy, Spain and France, countries where I have never been. I have always loved to listen to the stories of travellers, and to read descriptive books with settings in faraway lands. One of my favourite writer's novels are often set in Greece. When I read of Athens and Mikonos I can see the wild gladiolas on the cliffs, hear the birds call, and taste the dust of the roads baked by the heat. Sometimes I watch the film version of Mamma Mia just so I can gaze at the extraordinary scenery of that particular part of Greece. Yesterday, still recovering from a bad cold, I watched a film I have been meaning to see for ten years. When Ian and the people he had travelled to Europe with gathered for coffee one morning last week, they invited my daughters and I to join them. We were looking at one of the group's photos of their day in Montmartre, where Sacre Coeur cathedral keeps watch atop the highest point in Paris. In the photos were several photos of Cafe des 2 Moulins - Cafe of the two Windmills - an art deco cafe made famous by the French film Amelie. 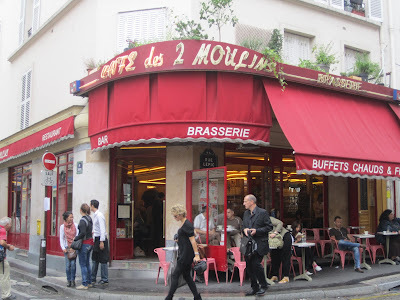 Apparently, if you sit in a booth at Cafe des 2 Moulins your cafe au lait costs 3.80 euros, but if you stand at the counter it costs 2.50 euros. To sit in the spot where Amelie's love interest sat, well, that costs even more. One of the photos shows Ian, and four others sitting at a table. The other of their party, the father of one of the girls chose to stand at the counter, muttering something about not paying good money to sit in a booth. In one photo Ian and his travelling companions are posing with a waiter, a young man who played up his quirky Frenchness - and gained many repeat customers among the tourists that way - my husband added drily when Ian told him the story. As we passed the photos around the table of our own local coffee house, I mentioned that I had always wanted to see Amelie, and had never been able to due to it not being available at any of the video stores I knew. One of the young women said she owned a copy of the film and would be happy to lend it to me. She dropped it off at my house early the next morning on her way out of town. She was off to begin her second year of university in Vancouver. 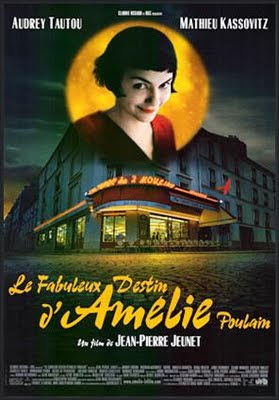 the film was simply titled Amelie. Amelie was nominated for five Academy Awards in 2001. Now that I have seen it, I think it must have been quite a revelation to film lovers at that time. Everything about it, except for the plot which, to me is a fantastically dressed fairytale, is unique, or was in 2001. I do not want to give the plot away too much to the, perhaps, ten other people on the planet who have not seen Amelie, but suffice it to say, Travelocity's use of a travelling garden gnome in their ads is not an original idea, and the main character of the film is so well loved I know of at least one person who named her first born child after her. Most of all, the film is full of flavour, one that is distinctly and evocatively Parisian. I have seen other French films (I do not mind subtitles at all having grown up reading the bass clef and treble clef simultaneously when studying the piano) and while they are all unique stories, they all still share something of the same French flavour, one that is steeped in wine and wonderful food, a tumultuous past, and a passion for life and for love. Now that I've finally seen Amelie, and gotten a taste of that Parisian flavour, I think I'll continue my armchair travels of France with some more films...Chocolat, A Year in Provence, J'aime Paris, etc.,etc.,etc. The arts are rather useful that way. A Time to Ponder, then carry on. Her nametag read 'Senior Accounts Manager'. She wore a soft, ruffled pink and cream floral blouse with a light cardigan, and her dark curls were pulled off her face but let fall on her shoulders. She came out to greet us in the bank's main hall, and with a soft, kind voice, invited us in to her office. Two of us had arrived on time, the third member of our party was running late. As we began to fill out the paperwork for our non-profit arts organization, the accounts manager helped us along, explaining her familiarity with non-profits by her own involvement on the board of a local women's transition house society. Part of the paperwork involved listing the occupations of all our board's directors. One of us is a full time artist and art instructor and one of us is a general manager for an arts festival. One of us is a tax accountant, another is an administrative assistant in a training facility for the Royal Canadian Mounted Police. We are a small board of directors and it was soon time to state my occupation. I said what has been my answer to this official question for the past twenty years: homemaker. As we waited for our third member to arrive, we chatted some more. It turned out the senior accounts manager is also a silversmith (she makes jewellery) and something of a painter. I rarely meet such a kindred spirit in a bank setting, and it proves, once again, that people are often so much more than the label on their nametag. Late that night, as I tossed and turned, trying to get back to sleep after a spell of wakefulness, I pondered the whole classification of occupation, particularly mine of 'homemaker'. I know that many women are content with cleaning, organizing, sewing, baking and cooking, and gardening as their job description. If only I were, it would make life a whole lot easier. It is not that I don't enjoy making a home for my family, I honestly do. I consider myself lucky to be home for my kids when they come home from school, and usually have some fresh baking for them, just as my mother had for us. I know how important it is to provide a welcoming place for my hard working husband to 'land' after a day of problem solving, trouble shooting, and human resources issues at the hotel where he is a manager. It does my heart good to see him look up from his dinner plate with a weary smile and say to me, "This is really good." The thing is, homemaking is not quite enough for me; I am compelled, like many other women, including my mother before me, to reach out to the world beyond my little home sphere. So, while for official purposes I must write 'homemaker' on the dotted line, I, like the senior accounts manager at the bank, am occupied with much more than my title would suggest. In addition to heading two volunteer-run organizations, I also have begun to sing with an acapella quartet of women - we have performed once already, and have begun to rehearse for an event in October. 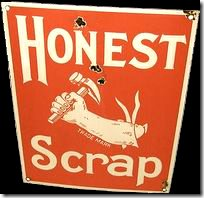 I also hold an on-call paid postion, work I welcome because money is sometimes tight. As if I weren't busy enough, there is also a sort of underground stream of consciousness running in my brain, which is constant and demands attention as well. This stream is my creative self. When I heed its demands and work with it, it does what a stream does, refreshes me and conquers this constant thirst I have to make sense of things by putting them into words. I am beginning to think I need to let that stream widen and flow with more assurance, but how? There is always so much else to do. 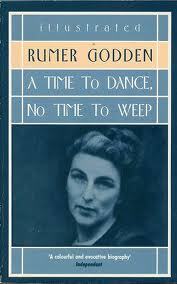 I have been reading the autobiography of a favourite writer, Rumer Godden. I have read several of her books, some of which I think brilliant in depicting the emotional landscape of sensitive souls. Godden was more than a writer, she was an artist in every sense of the word. Writing was her life's blood, not just a stream running through her other pursuits. Her life was often difficult, but she was propelled forward by the need to be true to her great gift as a writer. Sometimes she made decisions which required her to, in her own words, 'harden (her) heart.' A single mother (until she married the capable, solid and supportive James Haynes-Dixon) whose children often kept her sane, Godden placed her girls in boarding school when they were old enough so she could concentrate on her writing, although her children desired strongly to stay with her. She, of course, had to make a living as she received no child support, and this fact was also an impetus. Unskilled in the kitchen and lacking in household management skills, Godden hired help. She became highly successful and fulfilled, but she worked, and worked, and worked at her writing. 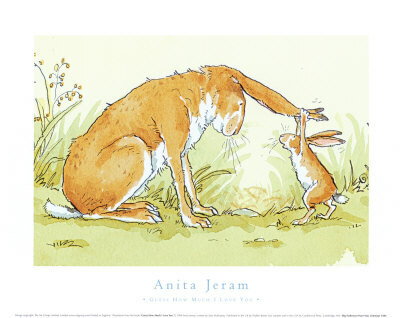 As with other successful artists, the right people came into her life at the right time, and helped her carry on, often when she believed all hope was lost. While not in Rumer Godden's class, I understand and appreciate much of what she says in her autobiography. It is clear she knew what she was meant to do on this earth, and did it to the exclusion of most other things - although for a time she supported her family as a dance teacher, and during the Second World War while she and her children were exiled in Kashmir, India, she and a friend earned money by growing and collecting herbs for tisanes and herbal remedies. While Godden genuinely loved children, enjoyed teaching, being a mother, and making herbal remedies for a time, she always knew in her core that writing was the piper she must follow. When her children were very young, she rose at 4:30 a.m. and wrote in the cold. Stories often just came to her, their characters growing almost of their own accord, and by the end of her long life, Godden had produced an impressive list of works, many of which can be found in the Classics section of quality book stores. Most wise people say, 'choose one thing to do, and do that one thing well.' I envy people who can operate that way. When I think of devoting myself entirely to writing, I know I would find it hard to figure out which of my other occupations to give up. They all seem important and worth doing, so for now, I do them all. September is particularly taxing with grant applications to write, programs to start up, kids to help adjust to new teachers and courses in school, but I muddle along and somehow everything gets done. I live in hope that one day I will be struck by some defining idea of the one thing I should do, and do well, and I will know how to proceed. Until then, I suppose I will continue to marvel at those who have already been struck and been brave enough to act on that inspiration. 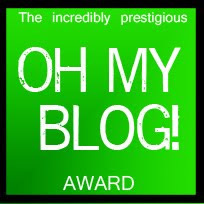 Or perhaps I am just one of those people whose many occupations serve to make a whole person with a wider view of the world, much like the lovely senior accounts manager who surprised me and brightened my day. Time, and my evolving life, will tell.